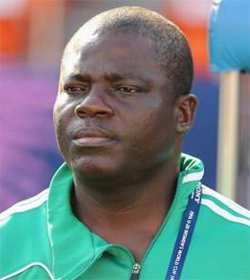 The Nigeria Football Federation has appointed Christopher Danjuma as Head Coach of the U20 Women National Team, also known as Falconets. Danjuma will be assisted by Wemimo Matthew (1st Assistant Coach), Mansur Abdullahi (2nd Assistant Coach) and Abdul-Lateef Yusuf (Goalkeeper Trainer). The quartet is expected in the Federal Capital, Abuja on Wednesday next week to open camp for the screening of players for next month’s FIFA U20 Women’s World Cup qualifying match between Nigeria and Tanzania. According to fixtures released by the Confederation of African Football, two –time FIFA World Cup silver medallists Falconets will take on Tanzania in Nigeria on the weekend of 15-17 September, with the return leg in Dar es Salaam two weeks later. The winner over both legs will then confront the winner of the fixture pairing Morocco against Senegal in November, before a final round of qualifying matches in January 2018. The Falconets have played in every edition of the FIFA U20 Women’s World Cup since it was launched as an U-19 tournament in Canada 15 years ago. The team reached the quarter finals in Thailand 2004, Russia 2006 and Chile 2008, before finishing as runners –up at the 2010 finals in Germany and at the 2014 finals in Canada. The Falconets reached the semi finals in Japan in 2012 but failed to reach the knock –out stage in Papua New Guinea last year.